Why do we call conventional cell culture equipment People-Centric? It seems to meet the needs of people, and has for many years. Manufacturers of conventional incubators, hoods, glove boxes, etc. have done a good job making products that people like and buy. Most people perceive conventional laboratory appliances to be reliable, economical, good looking, convenient, and perfectly functional. For the most part, they are! However, sometimes cells need more! That's where we come in. 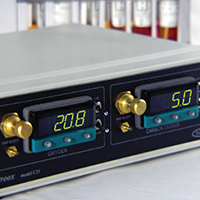 Since 1976 we have been "souping up" conventional People-Centric cell culture equipment. Others soup up hot rods. We soup up laboratory appliances. We soup up incubators, glove boxes, hoods, flush boxes, etc. We got started upgrading our own equipment while working in a cell research lab. First was a retrofit O2 controller for our CO2 incubator. We had heard bone marrow stem cells like ours grew better in a lower O2 tension (5%) than our CO2 incubator could provide (18-20%). It worked great. Colleagues started asking if we could make them one for their incubator. Turns out it fit and worked in any make and model. Soon word-of-mouth spread. Eventually requests were coming from cell scientists all over the world. Later, of course, incubator manufacturers would build the feature of O2 control into their incubators. But by then our little modular retrofitting O2 controller had successfully transformed hundreds of their CO2 incubators into O2/CO2 incubators with the O2 levels cells needed. Today thousands of CO2 incubators around the world have been upgraded. More are getting "souped up" with O2 control every day. Next was a combined O2/CO2 controller to retrofit glove boxes. People were trying to handle and grow mammalian cells in anaerobic bacteria glove boxes. We transformed anaerobic bacteria glove chambers into incubators with gloves that could grow and handle mammalian cells. Again, word-of-mouth spread. Eventually requests were coming from cell scientists all over the world. Later, of course, bacteria glove box manufacturers would build the feature of O2/CO2 control into their glove boxes. But by then we had already transformed many bacteria glove boxes and still do today. Then scientists started asking us to design and build all sorts of new and diverse custom upgrades. 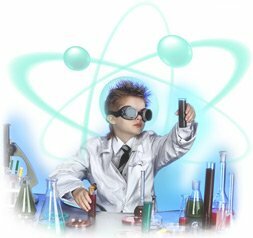 Our reputation, as specialists in souping up conventional cell culture equipment, led to many new abilities, for all sorts of new features. Curiously, and gratifyingly, many were well known scientists, top scientists. They came to us because they could not get what they needed from laboratory appliance manufacturers. They needed more than what conventional equipment could provide. Their cells needed more. Over 20+ years we developed and delivered dozens and dozens of solutions. These all consisted of modular upgrade accessories and retrofits, for all sorts of makes and models of incubators, glove boxes, flush boxes, etc. In one way or another they all increase the functionality of basic laboratory appliances with advanced what-we-now-call Cytocentric® features. The result? No matter what equipment you may currently own, no matter what it might currently lack in functionality, you can now too meet the needs of your cells! A few years ago, for the sake of cells, we decided to re-think and re-invent cell incubation and processing. It resulted in what most will agree is an exciting new alternative to conventional laboratory appliances, The Xvivo System®. However, you can still provide for virtually any need your cells might have, by simply upgrading your existing People-Centric Equipment. Depending on what cell culture equipment that might be, select the corresponding icon to the right and learn about all your Cytocentric upgrade options. Change the ambient O2 level to a lower physiologic level. Simply insert and operate your incubator inside the I-Glove with physiologic O2 control. 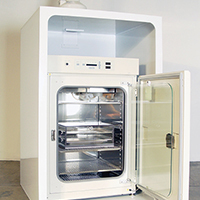 I-Glove is the first and only glove box designed for housing incubators. Retains entire volume of incubator. Additional advantage of hands-on uninterruptibility, low gas consumption, and contamination protection from closed system. Integrate your O2/CO2 or CO2 incubator into an Xvivo System® model X3 with physiologic O2 control. No change in O2/CO2 when open incubator door. Additional advantage of hands-on uninterruptibility, low gas consumption, contamination protection from closed, aseptic system, and full integration of any other incubation and processing procedures and any 3rd party equipment. Add controllers or upgrade to our high performance incubators for dynamic control during incubation. Add multiple incubation chambers to increase the number of different protocols. 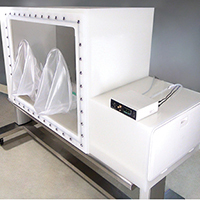 Add SubChamber Culture System to incubator and shuttle closed chamber back and forth to C-Shuttle Glove Box without exposing to room air or technicians and hands-on uninterruptibility. Directly add O2 control to the CO2 incubator. Upgrade CO2 incubator with ProOx modular O2 controller with a SubChamber Culture System that controls physiologic O2 inside, isolated from the rest of the incubator. Transforms it into O2/CO2 incubator with wider range of O2 control including deep hypoxia down to 0.1%, which most built in O2/CO2 incubators can't do. 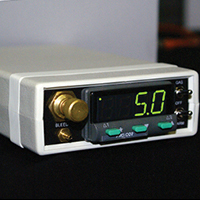 Add additional controllers and subchambers to increase the number of different protocols in one incubator. It is cost efficient because you don't have to buy a new incubator. Additional advantage of space efficiency, gas efficiency or low gas consumption, and hands-off uninterruptibility. Opening incubator door will not disturb physiologic O2 or hypoxic O2. 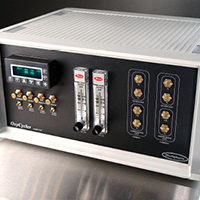 Add SubChamber Culture System accessory to your incubator and provide exactly the conditions each different culture requires. 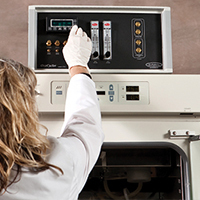 You can have as many different protocols as the number of SubChambers you can fit inside your incubator. CYTOCENTRIC SOLUTION #1 - Directly add dynamic control to any existing incubator. 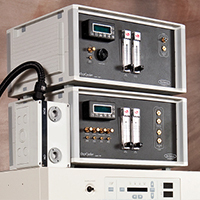 Modular retrofitting O2 and/or CO2 controllers such as the OxyCycler can fit any make or model, thermal incubators, CO2 incubators, O2/CO2 incubators. Retains volume of incubator, no matter how large. CYTOCENTRIC SOLUTION #2 - Add SubChamber Culture System with dynamic control. Space efficient and gas efficient. Appropriate for smaller cultures. Conventional BSL2 hoods do not control any cyto-parameters (temperature, CO2, pH, O2, etc.). 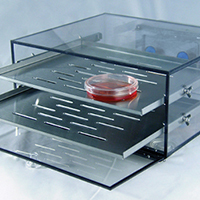 People processing cells in a hood usually hurry because they know their cells are exposed to suboptimal conditions. Regarding O2, the exposure to air during cell processing in hoods can confuse the action of O2 regulated genes. In fact, cells left in the hood long enough will die. Transport cultures across the lab or across the building in closed transport chambers to avoid contamination risk on route. Attach integrated Xvivo System® closed hood via buffer chamber for processing open cultures and limit use of open hood for staging closed cultures and supplies before entry, and other clean procedures. 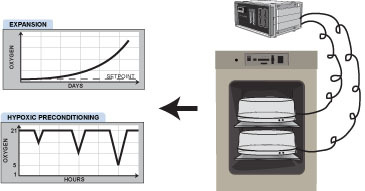 Integrate incubation and processing with hood so cultures never have to come out into the room. We were the first to routinely put O2 control in bacteria glove boxes starting in 1984 and the first to routinely put O2/CO2 control in bacteria glove boxes starting in 1986. Upgrade to an Xvivo System® model X3 with high performance, dynamic incubators. Integrated incubators allows for unlimited protocols and simultaneous different exposures. Additional separate, unlimited processing chambers allow you to accomplish any processing procedure without disruption. Add an accessory microscope chamber or other 3rd party equipment. Put your O2/CO2 incubator inside an I-Glove with identical O2 and/or CO2 levels. This way every time you open the incubator door, there is no change in either O2 or CO2 levels. Retains entire volume of incubator. Additional advantage is greatly reduced gas consumption because the incubator no longer has to recover after a door opening. 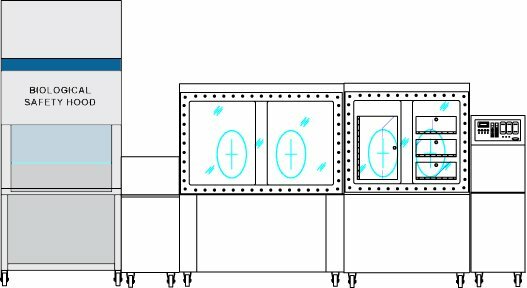 Third additional advantage is reduced risk of contamination by closing incubator inside aseptic environment. Upgrade with remote SubChamber Culture System and C-Shuttle and move closed chamber back and forth to C-Shuttle Glove Box without exposing to room air or technicians. Use multiple c-chambers for multiple protocols. Direct addition of O2 and/or CO2 control with modular retrofit controllers and integrated SubChamber Culture System (Any existing glove box can be fitted with a ProOX 110 and/or ProCO2 controllers, or the ProOx C21 with combined O2 and CO2 control. )Depending on size of glove box determines limit of how many chambers and how many different protocols. 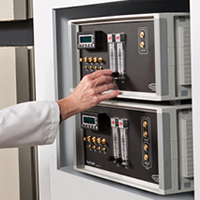 Upgrade with retrofit SubChamber Culture System chambers with dynamic control. Each subchamber can have different conditions at same time. One handicap with flush boxes is the reliability of "conditioning", as opposed to real time control. Trouble is, if the seal is not perfect, conditions won't hold. There is no way to compensate if a leak occurs. Worse, there is no way to tell if something like this happens. If you get inconsistent results, you don't know if it was due to the lack of control or something else. Now you can prevent these problems by upgrading your flush boxes with feedback control. 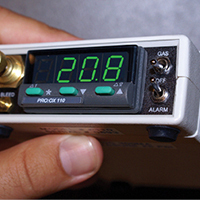 Add a ProOx controller for O2 control. It continuously measures the conditions inside the flush box and compensates for any leak. If conditions start to show drift away from optimum, it will infuse just the right amount of premix to keep conditions optimum. For more versatility than a premix with fixed gas proportions, upgrade with a ProOx C21 controller. 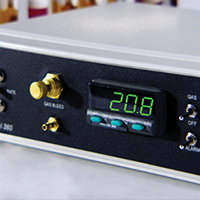 Set the O2 and CO2 concentrations to any level you want. Get more consistent results by directly controlling the atmosphere in real time. No longer depend on the perfect seal. Another handicap is apparent when you access your cells, you have to open the flush box. Optimum conditions are lost. Now meet cell need for full time optimization during handling by adding a processing chamber with controlled environment same as flush box. To keep O2/CO2/temperature/CO/NO etc. constant during any manual or automated handling, move the flush box into a properly configured Xvivo System® before opening. Cells in culture are not static, yet conditions inside a flush box usually are. Eliminate that handicap by fitting your flush box with a dynamic OxyCycler controller. Another handicap with a flush box is the work it takes to operate. If the technicians culturing cells are too busy with flush boxes, cell needs can be neglected. Substitute your flush box with a C-Chamber. They sit on a shelf inside your incubator. Instead of all that clamping and unclamping, carrying back and forth, stopping and starting flushing, eliminate it all. With a C-Chamber, simply open the incubator, then open one more small door. You get all the advantages of a closed chamber, with none of the work. Plus C-Chambers are completely compatible with our cytocentric controllers. Eliminate all the work. Eliminate all the limitations. Meet all the needs of your cells with the Xvivo System model X3. Are active culture vessels already quite good at meeting the needs of cells, but only while the cells are inside during active operation. It's the before (seed cells) and after (harvest cells) that may be of concern. 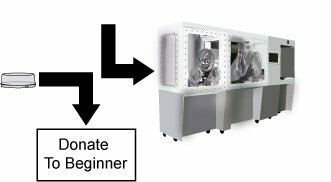 Bioreactors are different from conventional laboratory appliances used to culture and process cells in passive culture vessels such as plates, flasks, bags, roller bottles etc. Bioreactors are active culture vessels, which means they are usually closed and dedicated to their one cell population and actively sensing and responding in real-time to cell needs. Frankly, we were never asked to 'soup up' a bioreactor. However, they are included in the People-Centric category because of the cells that go into a bioreactor, and the cells that come out. Cells that seed bioreactors are usually grown and processed in typical People-Centric open CO2 incubators and open hoods. The consistency and quality of the seed cells can have a significant impact on bioreactor performance. Cells that are harvested from a bioreactor may also be processed in open People-Centric hoods. Again, the quality and consistency of the cells may be damaged if the needs of the cells are not considered during processing post-harvest. Traditionally, the word 'bioreactor' conjures up images of large stainless steel vats. It is true they were formally used primarily for large scale cell production. However, there is a recent trend toward downsizing and more functionalizing. Many new smaller bioreactor systems are being developed, with innovative specialized designs. The result is an increasing application of bioreactors outside of large scale production, for example, in small scale production and even research. However, sometimes seed & harvest cells need more! 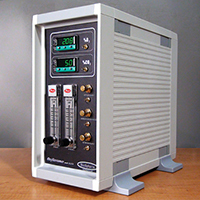 Some of the new small bioreactors need to be located inside an incubator. They use the temperature, CO2, and/or O2 control of the incubator to passively control cell parameters. Incubators were not designed for cells. They were designed for people. Whether your bioreactor operates inside an incubator or not, integrating it inside an aseptic cell optimized environment will save you time and increase the quality and consistency of your cells. Chance of contamination goes down. Seeding cells, sampling cells, harvesting cells all can be done without worry of contamination or suboptimal conditions. Cleanrooms are no longer required. 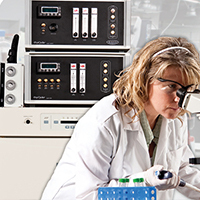 The Xvivo System® can integrate any bioreactor into a completely cytocentric environment. Yes, any bioreactor! Large or small, perfusion or batch, clean-in-place or disposable. Seed cells upstream, sample cells instream, and harvest cells downstream. Call for details. On a smaller scale, especially for those bioreactors that operate inside an incubator, the I-Glove provides the cytocentric advantage immediately! SOMETIMES CELLS NEED MORE... than people!